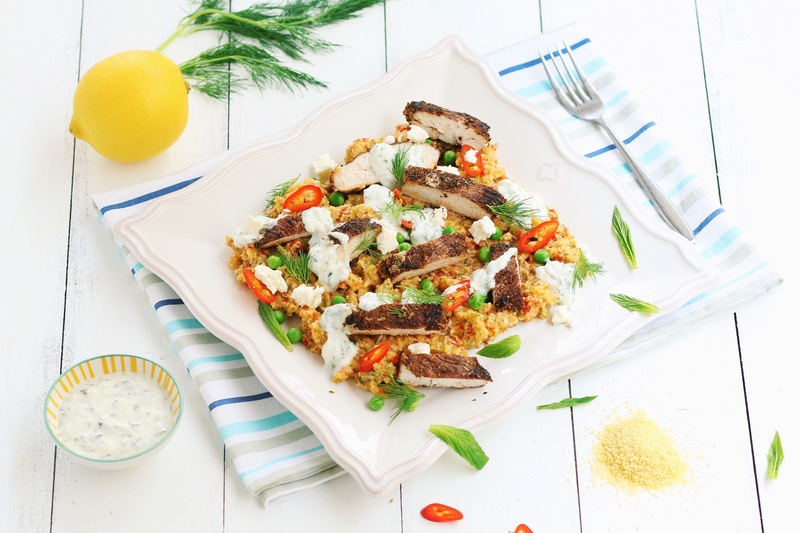 Next time you make this Greek Chicken Salad, you will be captivated with its beatufiul and vibrant colours: a bed of light and fluffy couscous, dressed with little gems of finely chopped capsicums, spring onions and chillis, also topped with caramelised chicken breasts arranged beautifully making a statement. The smell of fresh herbs – sweet dill and cooling mint – is inviting everyone to a classic and elegant summer. The taste does not disappoint either. 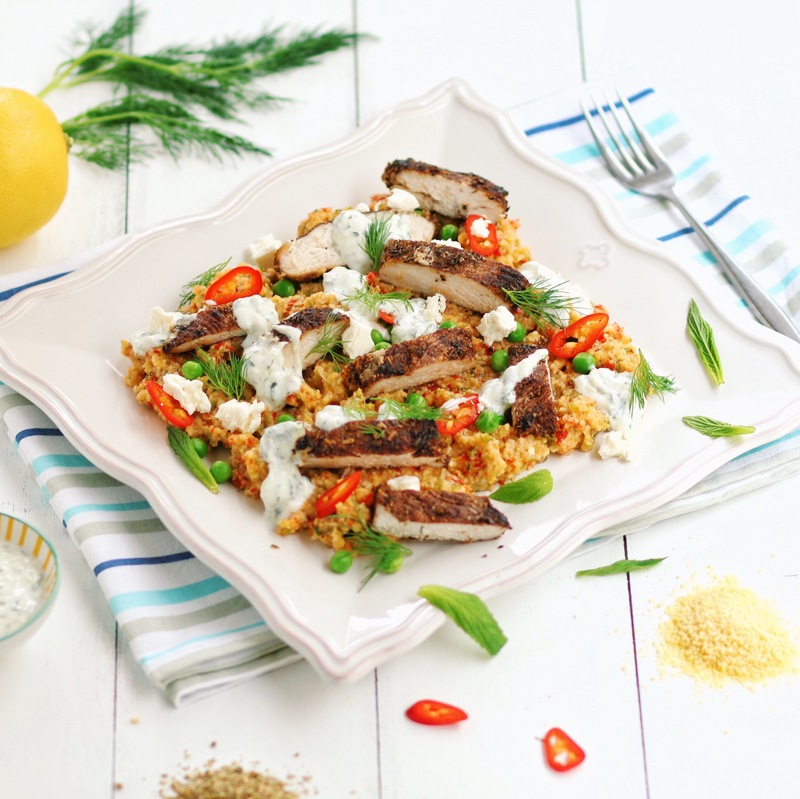 All the flavours work so well together as a rehearsed orchestra, complete with soothing cucumber and yoghurt tzatziki, and crumbled feta waiting to sing as if it was the last day in her life… Magnifique! Mix 1 cup of couscous with 2 cups of hot water in a bowl with a pinch of salt. Cover. Cut chicken breast horizontally to 1cm thick. Season chicken with salt, pepper, oregano, allspice and zest of one lemon. Fry chicken on a hot pan with olive oil for around 3 - 4 minutes each side until cooked through. Using box grater, coarsely grate cucumber. Sprinkle generous amount of salt, and mix. Squeeze and discard excess liquid. Combine with yoghurt, lemon juice, and coarsely chopped mint. Season with a pinch of pepper. Remove stalk and seed of capsicums. Coarsely tear them along with spring onion, chilli and put into food processor along with dill. Pulse until they are finely chopped. Microwave frozen peas for 30 seconds - 1 minute. Combine couscous, vegetable and peas, and squeeze in lemon juice and olive oil. Toss together and season to taste. 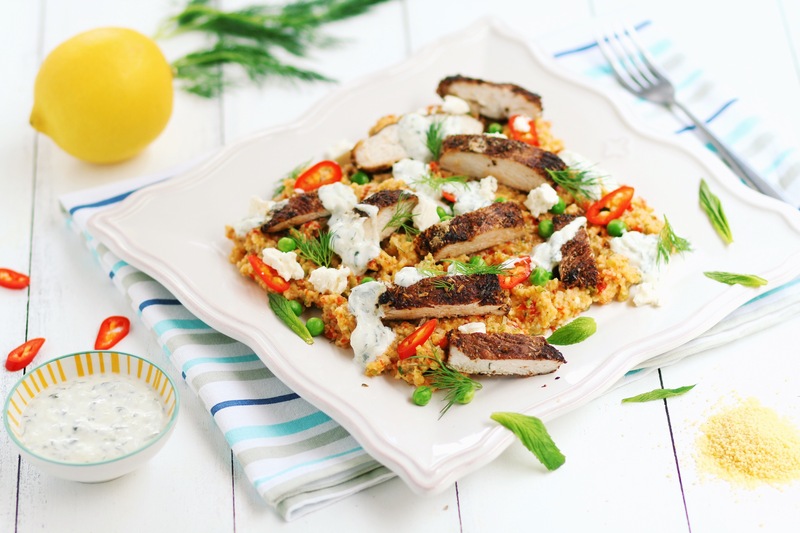 Slice chicken and put on top of couscous. 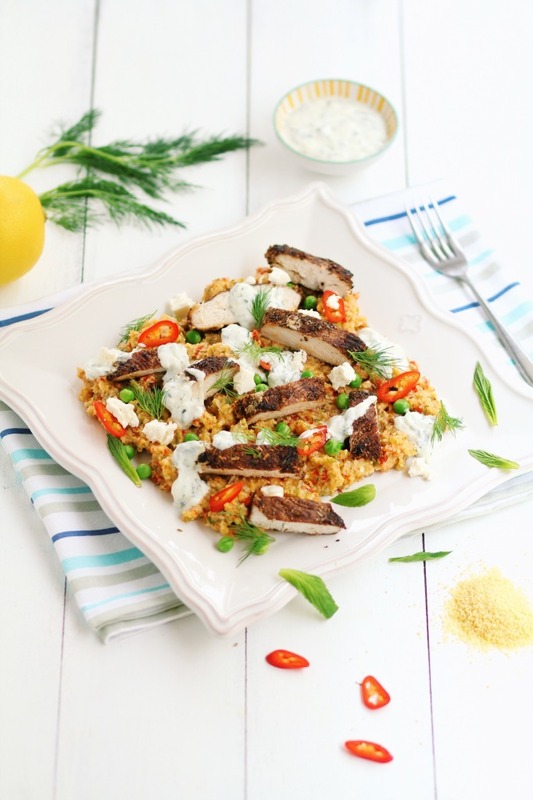 Crumble feta and serve with tzatziki.